Back in 1999, when I was editing Computing Japan magazine, we ran an article entitled “Third Generation Mobile: Three Groups for 3G” looking at the three groups — NTT DoCoMo, IDO-DDI (later, with KDD, KDDI) and IMT-2000 Planning Corp. (later J-Phone) — lining up for a new license. The prediction was that “success for the 3G business depends on the digital content.” Now, 7 years later, three new hopefuls are lining up in a far more mature market, and not only content but also terminals, churn, number portability and voice versus data will be significant factors. 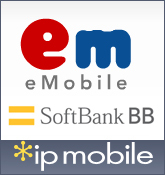 On November 10, Japan’s Ministry of Internal Affairs and Communications said it would grant three new carriers licenses to operate in the 1.7 and 2 GHz bands; BB Mobile of Softbank Corp. and e-mobile of eAccess Ltd. will offer services based on W-CDMA technology while IPMobile Inc. will offer Japan’s first TD-CDMA-based services. The three are expected to launch later in 2006. The three newcomers are entering a highly competitive market dominated by three existing incumbents: NTT DoCoMo Inc., KDDI Corp. and Vodafone K.K., which reported a collective 89.4 million subscribers as of October 31. The new players are expected to expand the variety of wireless services and pricing levels available, providing more choice and lowering costs — not least of all for terminals — according to one ministry quotation (WWJ subscribers login for the full story). The other new entrants were similarly breathless in their predictions of the coming ‘ubiquitous,’ ‘networked,’ ‘next-generation,’ or ‘intelligent’ (pick your adjective) mobile future. While such comments may be somewhat self-congratulatory, there’s little doubt that the long-awaited news will fundamentally remake this country’s wireless and mobile Internet arena. By 2007, NTT DoCoMo’s home market will have undergone an entirely unforeseen transformation. First, a little history. Since the start of 2G mobile in the early ’90s, DoCoMo has been the undisputed heavyweight in the market. The part-government-owned former monopoly carrier set prices, dictated handset specifications, kept the retail distribution channel in line, controlled sales, told makers and distributors how much of a subsidy they would receive, knocked heads together and generally ran the market like a fiefdom. Japan’s handset makers — the NECs, the Sonys, the Panasonics et al — are a savvy lot of engineers who realized early on who was boss and how that boss liked to play. DoCoMo gave specifications in advance to the selected few who then got an early sales lead when new model series were released. After dominating Japan’s cellular handset industry in the late ’70s and ’80s, the Motorolas and other foreign makers were gradually edged out. With its own 2G network standard, Japan became a closed island. The start of i-mode itself was possible largely because DoCoMo had the market influence necessary to line up the value chain of network operator, portal owner, content providers, application developers, terminal makers and customers. Domestic competitors, if any survived, could be left to feed on table scraps. The 3G era was supposed to be more of the same. W-CDMA, a voice-centric network technology into which DoCoMo invested significant R&D resources, would usher in a new global era. Instead of being excluded from participating in the US and GSM markets, Japanese terminal and infrastructure makers would be right in front with the Nokias, Ericssons and Motorolas. Costs at home would fall as Japanese suppliers gained economies of scale and the rest of the world adopted what is, at least in part, the “Japanese” network standard. By some estimates, DoCoMo would save JPY600 billion through actively promoting i-mode and W-CDMA overseas. Thus, at great capital expense, DoCoMo sparked the beginning of this profitable new era with the start of its FOMA 3G service in October 2001, the world’s first major-market 3G roll out. Again, domestic competitors, if any survived, were to be left to feed on table scraps. In the 3G era, however, Japanese makers’ handset costs have remained stubbornly high. The market’s insatiable demand for new features is a pricey proposition to meet. Dual multi-megapixel cameras, fast processors, lots of onboard memory, extremely advanced LCD and OELD displays, audio processors, robust batteries and digital TV reception are just some of the technologies that now define high-end terminals. DoCoMo has had to take some of its massive i-mode profits and directly subsidize the terminal makers to “encourage” the development of new-tech W-CDMA terminals. Further, those pesky competitors are proving to be, well, pesky. While DoCoMo was wrestling with FOMA network build-out and new terminal R&D in 2001-2003, KDDI got the jump with 3G using Qualcomm’s CDMA 1X system. Sure, the carrier had to subsidize cool new 1X terminals to the tune of 20,000-30,000 yen each (publicly available estimates vary somewhat), but DoCoMo, initially, was subsidizing W-CDMA models in the 50,000-yen range — and they still cost 50-60,000 yen at retail! In late 2003, KDDI also made use of CDMA 1X EV-DO’s better bandwidth (they also faced a smaller customer base making less data demands on the network) to launch full-track music downloads and flat-rate data — senior DoCoMo managers’ worst-case scenario — forcing DoCoMo to offer flat-rate data in order to compete. Nonetheless, for DoCoMo, 3G seemed recently to be back on an even keel. The carrier is converting 2G users to FOMA at a growing clip, average FOMA revenue is higher than on 2G, they will regain 3G market share lead from KDDI early in 2006 and, overseas, the i-mode alliance is growing modestly after a rocky start (O2 in the UK and Germany have recently joined as well as several other, smaller carriers). DoCoMo’s handset partners have even established at least a toe-hold in Europe, where Sharp is now supplying top-of-the-line W-CDMA models to Vodafone. NEC has also become a major overseas supplier of i-mode server infrastructure as well as 2G terminals. Perhaps the 3G era will play out to Big D’s ultimate advantage after all, despite the three new entrants raising a lot of smoke and noise! DoCoMo’s Chief Financial Officer Yoshiaki Ugaki even displayed some of the old uberconfident sangfroid last week, telling a Reuters correspondent “From what we understand, the three companies will not be starting services until the very end of the next business year;” he predicted that there’d be little impact of the company’s thriving 3G business. Don’t bet on it; in fact, the tatami mat is about to be pulled out from under DoCoMo’s feet. Whether DoCoMo — or any of the 3G incumbents — realize it, last week’s news was further indication that Japan is entering the post-3G era. And i-mode — or any cool data portal — alone is no longer any guarantee of survival. The first effect that the three new entrants will trigger is handset/terminal price destruction. and give away low-cost DSL modems to new subscribers for his Yahoo BB home broadband service; it’s easy to imagine his white-coated teens doing the same with free dual-mode mobile phones that come bundled with IP calling in the home and cellular service when outside — all for a single monthly fee. A fair guess would be 7,900 yen per month for a “total” bundle of home DSL service, a WLAN router, a dual-mode WLAN/W-CDMA mobile phone and tabehoudaiall-you-can-eat data. Look for eAccess, which also runs a thriving broadband business, to do similar. IPMobile, on the other hand, will offer low-cost data cards, enabling to IP phones, laptops, PDAs or music players to grab data anywhere. They will also resell packets via MVNOs, allowing for even further market segmentation and more profits. None of the three incumbents have ever allowed an MVNO to undercut their 2G or 3G digital cellular services, and it’s arguable that they may not know how to. The result will be that Japan’s current line up of over a dozen handset makers will inexorably undergo consolidation in the next couple of years. The top six that supply DoCoMo (Sony Ericsson, Panasonic, Fujitsu, Mitsubishi, Sharp and NEC) will undoubtedly survive, as will KDDI’s top suppliers including Toshiba, Kyocera and Hitachi. But unless they can figure out how to cut costs and evolve from their expensive, lovingly hand-assembled production methods, smaller makers like Japan Radio Corporation and others face a tough, tough situation. Even Sharp, originator of the first camera phone with J-Phone and one of the few which have gained top-tier ranking as a DoCoMo supplier in the past few years, recently reported lower-than-expected profits — despite growing phone sales. The next effect the new market entrants will create is multiple segmentations across levels of handset complexity (and hence cost/price) and types of data usage. The new entrants will serve wider audiences with lower-cost, targeted terminals. Want a cheap phone for cheap voice calling only? Choose eAccess or Softbank. Want a music player only? Choose IPMobile for data on the go. Want mobile calling bundled with home access? Again, go with Softbank. DoCoMo, KDDI and Vodafone senior planners must be having a bird. But it would be too early to write off the incumbents, who are already showing signs of reacting aggressively. All three are admitting in the media and in private that their new strategies will have to focus on maintaining current customers rather than always focusing on new wins. DoCoMo et al may be better off leaving the low-profit, marginal customers who seek only basic features to the new entrants while focusing on high-margin mobilers who will use (and pay for) the new “premium” services like mobile digital TV, streaming music and video on demand. In fact, the new entrants will be stretched tight just building their W-CDMA and TD-CDMA networks and likely won’t be able to afford to build entirely new mobile services like digital TV. The incumbents should also take a hint from the new entrants and start to do some segmenting of their own. Why not offer lower-cost boutique or specialized terminals at a decent profit margin to narrow(er) slices of the market, if that’s what will sell? Indeed, they’ve already started to do so with repurposed 2G models that come in designer colors and form factors, with special features targeted at business folks, young women, etc. KDDI and Vodafone are doing the same. The incumbents will also have to change how they control distribution and subsidization of their terminals. Vodafone already caused consternation when they cut subsidies to the retail chain and to makers in 2004; DoCoMo and KDDI will have to do the same at some point, although this may be a cost to bear while their user bases undergo conversion to 3G. CFO Ugaki was quoted last week as saying the carrier might change the way it pays subsidies to narrow the gap between what they pay out to new and existing customers for phone purchases. Currently, a new customer pays only the fully subsidized price, while an existing customer must have been a subscriber for at least two years to get this break. Frustratingly, high-end 3G terminal costs are still high in Japan, as they are elsewhere. In Europe, where Sharp enjoys Vodafone’s massive sales channels, the difference between a subsidized V903SH (sold with a two-year contract) and one sold unsubsidized is huge; in Germany, the difference runs between 300 and 800 — for a whopping 500! Finally, he incumbents may need to do what the new entrants do: and bring in ore foreign-sourced handsets. Other than loss of pride, what’s wrong wth selling a cheaper but still good quality Nokia handset? Nokia even enoys a certain ‘platinum’ perception in the market and may be perfect as a mid-range business-targeted model. Vodafone already realize this and are rumored to be planning a Blackberry-style push-mail device based on the new E-Series terminals. Even DoCoMo have gotten the message and are already working with Korea’s LG to develop 3G W-CDMA terminals. As 2006 unfolds, the entrance of three new licensees isn’t the only unknown that will rock Japan. The ministry has also mandated number portability, and this in some ways is even more worrying in the short term for the incumbents than free IP phones being given away at train stations. A September telecoms research report from investment bank UBS Securities Japan Ltd. states, “one of the main factors that has led subscribers to switch from one carrier to another is phone handsets. If subscribers no longer need to give up their existing phone numbers in order to get the handset they want, we believe that many subscribers would not mind higher phone bills (more or less).” The report foresees the possibility of millions of subscribers churning from DoCoMo to KDDI as soon as number portability permits. Since the government announced number portability in 2003, the market has certainly exhibited jitters. Since the announcement, DoCoMo’s share price has been consistently lower than that of KDDI; it was consistently higher beforehand. Ironically, number portability may serve as a far stronger factor that allows the incumbents — with the highest quality handsets — to keep customers versus the new entrants hoping to pull them away with cheap terminals. In other words, Japanese mobilers want the handsets that they want, and if they have to pay more to get one from a trusted brand, so be it. Viewpoint: What Leads Mobile in Japan?